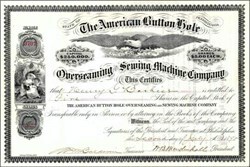 Beautifully engraved certificate from the American Button Hole Overseaming and Sewing Machine Company issued in 1897. This historic document has an ornate border around it with a vignette of an eagle and an allegorical woman with children. This item is hand signed by the Company’s President and Treasurer and is over 117 years old. 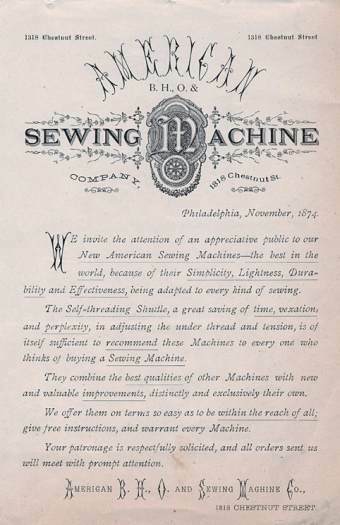 The company was founded Philadelphia, Pennsylvania in 1869 as the American Buttonhole, Overseaming and Sewing Machine Company - producing a machine that was capable of performing those functions. In 1874 began producing a vibrating shuttle machine that was unusual in that it utilized a round bobbin; machine was called the New American. The Company name was shortened to the American Sewing Machine Company. 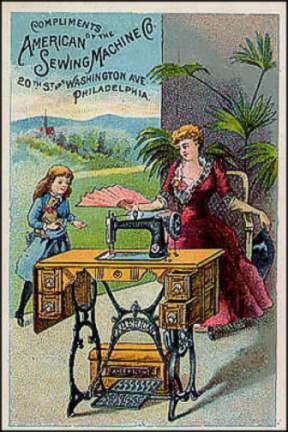 The company introduced a new model sewing machine in the mid to late 1880s - the Model 7 pictured on the cards included here - but was out of business by the turn of the century.